After tooth loss, dental implants in Bonita Springs offer the very best replacement option. And, just like no two smiles are quite exactly the same, so too do treatments for dental implants vary from one patient to the next. Sometimes the difference is dramatic. From the length of time you’ve been missing teeth to how many you’ve lost, a few factors come into play. 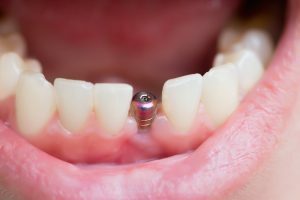 Remember that when we say “complex,” we don’t mean “difficult.” Your implant dentist is highly trained and experienced in the placement of dental implants — rather, complex means that certain considerations must be made to protect the form and function of your new tooth replacement. Keep reading to learn more about what can cause one tooth replacement case to be more complex than another. One of the most significant factors that will affect the complexity of your dental implant placement is how healthy and strong your jawbone is before implantation. Tooth loss reduces the amount of blood flow and nutrients being brought to the area, which causes the jawbone to gradually lose its strength. If you have been missing teeth for many months, you may need to have a bone graft or sinus lift to create the right environment for placement beforehand. The complexity of your dental implant case will also be determined by where in the mouth your teeth are missing. Because aesthetics are a primary concern of teeth in the front of the smile, replacing those located here is a little more complex than for molars or premolars. Your implant dentist will consider this as a factor when designing your dental implant treatment plan. Another consideration is how many teeth you need to have replaced. For a single missing tooth, you need one dental implant to support the prosthetic crown that is affixed on top. An entire arch of missing teeth in the upper or lower jaw may be replaced on as few as 4 dental implants with strategic placement. Likewise, a single dental implant may be able to retain a bridge replacing two teeth. Patients who smoke, use tobacco, or drink heavily are at a higher risk of experiencing dental implant failure. So, too, are patients with gum disease or health conditions that affect the immune system. If any of these apply to you, your prosthodontist in Bonita Springs will carefully assess the situation to determine whether or not you are eligible for dental implants — and, if so, how to increase the chances that your implant procedure will be a success. Are you interested in dental implants? Don’t wait to find out if you are a candidate. Your dentist will consider these and other factors to determine whether or not you can benefit from this comprehensive tooth replacement. If the answer is yes, we can’t wait to get started! The Pelican Landing Dental team offers comprehensive dental care, including implant dentistry, from the comfort of their state-of-the-art practice. To learn more about their services and whether or not you are a candidate for dental implants, don’t hesitate to request an appointment with your dentist in Bonita Springs.